Based on telephone interviews with EWC members from 82 companies in the metalworking industry, this study investigates the emergence and dynamics of both formal agreements and informal arrangements. 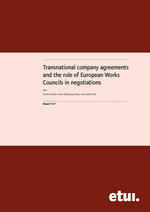 The study for the first time reveals the existence of informal arrangements between EWCs and transnational management which are documented in the minutes of meetings or in some cases are agreed only verbally. Like formal agreements, they serve to harmonise company policy on a wide range of issues such as transnational restructuring, remuneration issues, health and safety policies and shaping industrial relations arrangements within the company. They are therefore an important alternative tool of regulation at European company level. These findings suggest that: (1) in practice, EWCs go beyond their formal information and consultation role more frequently than is realized by either academics or policymakers –as well as many trade unions; (2) the regulation of industrial relations and working conditions at European company level is being promoted by more companies than was hitherto believed to be the case; and (3) because these developments are taking place within a legal vacuum, an optional regulatory framework at European level is needed which ensures negotiation prerogative for the trade unions according to their own internal procedures.